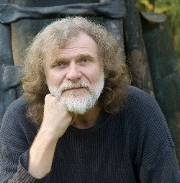 The generation of Petr Cisarovsky’s (born 1950) experienced its age of adolescent perception in the 1960’s thus growing up into the world of hopes. On the very eve of adulthood, before young artists could have proved themselves, this generation had been crushed by “normalization” process; some emigrated, others just went with the flow of the regime, many isolated themselves in their own private exiles, or survived in various nonconformist groups. After November 1989 it turned out that this generation, in terms of art, had practically ceased to exist except for a few solitary artists. Cisarovsky ranks among those exceptional individuals who created unique art while working away from the crowd. Although raised in highly cultured milieu (his father being a theoretician of art), he made his own artistic quest setting his own challenges. He originally learned the blacksmith trade in the town of Jihlava and then held a couple of odd jobs. Once he also worked as a roadie with a band. In the years 1969-1975 Cisarovsky studied at the College of Applied Arts in Prague specializing in sculpture. And he determined to stick to the material of his choice – from the very beginning he forged his sculptures of iron. The combination of art and craft proved to be the right and happy choice. In the following years, in order to make his living, Cisarovsky focused on objects of applied art – namely on realizations in the field of architecture. At the same time the first cycles of his independent sculptures came into being in his own smithy (set in Kokorin Woods in Bohemia) following in footsteps of “iron sculpture” which had already gained its reputation mainly in the 1950’s ( Cesar, Muler, Chillida, Rozsak). But even at that time it was high sculpture without attributes – pure and simple Brancusi, and expressive and later on more down-to-earth and slightly ironic Gutfreund – that was essential for Cisarovsky’s artistic orientation. With the lapse of time it is possible to decipher Cisarovsky’s trend leading from material towards idea, from emotion towards spirit. Tormented metal in the first cycle called Heads obviously tells its story of pain – iron treated as bare meat that is crushed under the blows of a hammer; the sculpture is actually complex of marks that are results of the blacksmith’s forcible gestures. Although in threatening Towers and Cages human beings are absent, these objects present secrets that put a spell on viewers who then feel spiritually integrated as if being a part of a “sculptural group”. Bleak expressivity of the sculptor’s early work goes hand in hand with grotesqueness which is almost equally disconsolate. Cisarovsky’s subject matters at that time ranged from beaten heads, sinister labyrinths to chilling jokes. In mid 1980’s the artist branched out into more extensive sculptures in the cycle Walkers. Metal sheets used for the sculptures are treated rather mercifully – blow marks are carefully dealt with thus attracting vibrating light. Details give up space to entirety; grotesqueness is replaced by kind irony; image expressing pain turns into more multifaceted image of existence. In the course of time Petr Cisarovsky found his own deep personal bond to Christianity without practicing in church. His sculptures are his confessions. In 1991 he commenced to work on his so far the most significant project- Gate of St. Francis which closes up the Franciscan Garden just a few blocks from Wenceslas Square in Prague. The gate he submitted after two years of intensive work belongs to the most remarkable examples of new sacral art in the Czech Republic – interestingly, it can be interpreted at a profane level as well. 24 forged figural reliefs depict Simpleton of God who, at the right moment for the church, found clue to the original Christian warmth of heart while church dignitaries passed their time over infinite theological disputes. These scenes could be understood both as mystical testimony and gentle, slightly funny strip of comics. Both aspects refer to each other. A simple human story reflects infinite secrets of life. In 1991 Cisarovsky completed his cycle Walkers by sculpture Big Fall; it depicts a chunky figure stepping over a kind of burden but simultaneously growing into it. The sculptor had, in a way, predicted a situation he found himself in a couple of years later after completing the Gate – how actually difficult it is for an artist to part with the project that reached its final shape. In a case like this an artist may further develop or use again already mastered approach, or he may seek for new, equally attractive subject matters or pick up ideas he worked on before. Cisarovsky does not want to atomize the poetics of the Gate being aware of the fact that big subjects are hard to get by. Last year’s sculpture the Wall, touching on the subject of human freedom, indicates return to existentially-oriented Walkers. However, the sculptor simultaneously toys with minor ideas and expresses them in the form of fine anecdotes. While working on the project Released Dalibor the sculptor invited over a spider to co-work with him. An iron skeleton carrying a fragile spider web suggests a poetic shortcut to a kind of satori – state of mind well-known to Zen-Buddhists. It’s a story; the web is a consequence of some previous action which is pretty ordinary at one level, while at the other level it touches on something inexpressible associated with creative forces of man and nature. Gate of St. Francis proved Cisarovsky’s great sense of mystique. His cooperation with Dalibor the spider belongs to the domain of mystique both small and quotidian. Poets are well aware of the fact that even the most ordinary form of existence appears as a miracle from a certain perspective. Petr Císařovský has chosen a demanding sculptural medium, for he mostly works with forged and wrought iron. Here it is impossible to be a good sculptor without also being a blacksmith – someone who has mastered this craft, but also a mythological figure who at some point in our mythical ancient history forged the entire world. It is something that requires skill and an intimate, personal relationship with the material and how it can be worked with fire. In a sense human imagination, especially artistic imagination, cannot dispense with fire. Each sculpture that emerges from the sculptor’s workshop or forge bears traces of the origin of the world, which here comes into being through the magic of the artist’s imagination as he seeks and reveals the meaning of human existence in the world. Composition and construction are important aspects of the sculptor’s work. The essence of Petr Císařovský’s sculptures, and their significance in modern sculpture, lies precisely in their entirely original combining of his fantastical imagination with the symbolic meaning of a sculpture’s construction. The fantastical element of this sculptor’s work is most apparent in his relatively small heads, whose bizarre organic structure has made them an important chapter in what is known as the Czech Grotesque. In the fire iron becomes a pliable material that can follow the sculptor’s imagination into the most bizarre absurdist metaphors. A distinctive group of sculptures deliberately exposes the dramatic, sometimes even fraught, process of their creation, where there are elements of uncertainty and chaotic disintegration, and a provocative randomness. Here construction and destruction play an equal role in a sculpture’s creation. Clear-cut forms are confronted with almost formless structures that are symbols of catastrophe. In the dramatic inception of their structures, these sculptures frequently express the risks inherent in our day-to-day existence, and they are an acknowledgement of the incalculability and openness of life. Yet most sculptures seek to overcome this justified view of life. A third major group comprises sculptures that present one or several symbols in some kind of meaningful configuration. These works seem to be trying to look beyond the relativity of human existence to find a unifying and collectively valid meaning. This is a profoundly human message, a concept that extends far beyond the explicitness of a particular emblem such as a shield. Here a sculpture has broken through the bounds of practical existence and entered the realm of what are ultimately irrational values, both certainties and uncertainties. These are works that elevate their subject matter into a universal symbol, such as Altar, a sculpture that synthesises a particular human experience over the centuries. Petr Císařovský is quite at home in German church architecture too: he made two gates for St Lawrence’s Church in Herne in North Rhine-Westphalia (Noah, 1995, and Ode to Creation, 1997-1998), where he successfully measured himself against the finest works of the Italian Renaissance. Although Císařovský is mostly concerned with abstract symbols, we should not overlook his figurative sculptures. These demanding works with two or more figures are based on a concentrated, generalised situation, with an unusual feel for the theatrical staging of a symbolic, figurative narrative. Petr Císařovský produced a series of scenes from the life of St Francis of Assisi for a gate in the Franciscan Garden in Prague, and a fictitious encounter between John Amos Comenius (1592-1670) and Erasmus of Rotterdam (1466-1530) for the door of house number 17 in Mostecká ulice in Malá Strana in Prague; both of these works are fine examples of wrought iron figurative reliefs. Petr Císařovský began with compositions influenced by Cubism and Futurism, from which he often quotes. However, as time went on Dada and Surrealism came up with the concept of the object. There was a new appreciation of chance, humour and parody, and with it came a radical relaxation of a sculpture’s tectonics. The postmodern relativisation of traditional composition – something we see in a substantial part of American sculpture – led from freedom to programmatic anarchy. Císařovský took advantage of this radical relaxation of composition to put the expressive power of these liberated compositional elements to work, applying them in a symbolism related to his own time and place. He has lived through times that were and still are difficult, and sculpture is here to give an account of them. We can read all this in Petr Císařovský’s wealth of sculptures. With the significance embodied in each individual sculpture, he has written one of the most compelling and persuasive chapters in contemporary world sculpture. Císařovský works mainly on fine art sculpture, but he also undertakes commissions in collaboration with architects.